Marg Isbester will be the next mayor of Greater Napanee. Photo by Adam Prudhomme. 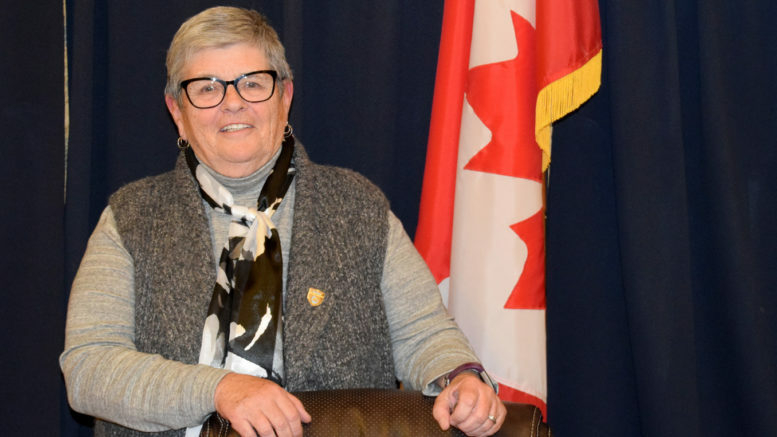 Marg Isbester will shift one seat to her left on Greater Napanee’s council horseshoe into the mayor’s chair while Max Kaiser will cross the floor to be seated to her right as deputy mayor when the new council is sworn in this December. Isbester, who is just finishing her first term as deputy mayor, won the top seat with 2,325 votes, beating Brian Calver’s 2,119. A. Sam Salam had 882 votes while Gavin Cross had 377 and Gerry Haggerty 336. Kaiser, who currently represents Ward 2, will serve as deputy mayor after defeating current Ward 4 councillor Carol Harvey by a count of 4,343 votes to 1,655. Isbester said she was relieved when the results — which were a bit delayed in being revealed at town hall — were finally posted. Isbester already has some ideas as to what will be some of the biggest issues to tackle as mayor. She said they will also have to look at which councillors will sit on which committees and perhaps even look at forming some new committees as well. “It’s going to be a ‘Let’s get to know each other first’ sort of thing,” said Isbester. Isbester’s win was a historic first as she becomes the first woman to serve as mayor of Greater Napanee. While she never made that part of her platform, she hoped it would inspire the next generation. Taking over her old role will be Kaiser, who had the most decisive victory of any candidate. As for the rest of the horseshoe, it will be made up of five new faces with no previous council experience. The deputy mayor-elect says he’s looking forward to working with the new council. He echoed those sentiments about the incoming mayor. “I have respect for Marg and Marg and I have always worked well together and I think that will continue,” said Kaiser. He says that although they may not agree on every issue, they will be able to work together for the good of the community. He also says he’ll look to Isbester’s experience as he now steps into his role on Lennox and Addington County council as well. Kaiser thanked not only the voters, but the fellow candidates who spoke highly of him while on the campaign trail. Representing Ward 1 will be John McCormack (843), defeating Cortwright Christian (189) and Robert Boomhour (83). Ward 2 winner was Terry Warren Richardson (691) over Terry Cook (314) and Robin Lee (198). Ward 3 winner was Dave Pinnell Jr. (432) defeating Richard Pringle (407), Terrilyn Geenevasen (354) and Gerry Marsh (230). Ward 4 winner was Bob Norrie (374) defeating Cathy Conrad (308), Jason McDonald (223) and Tom Derreck (200). Ward 5 winner was Ellen Johnson (334) defeating Shaune Lucas (332) and Bill Martin (327). Laurie French (3,126) was re-elected as trustee for the Limestone District School Board, defeating Roberta Lamb (1,977). Michel Charron (5) was elected over Diane Burns (3) for trustee of Conseil Des Écoles Catholiques Du Centre-Est.